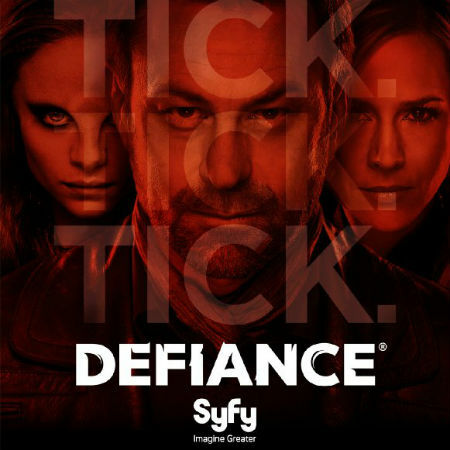 Syfy's Defiance premiered tonight, and to be honest, someone took a dose of brutal pills before writing this two-hour season premiere. There was a great recap at the beginning of the episode to remind us of all the predicaments everyeone was left in, from chasing baby snatchers to accepting your fate that an entire mine was coming down on your head. What surprised me was the turn the tale took for a few of the characters, where nearly an entire familial line was eliminated, completely. Did NOT see that coming, because it was a long-term character. It's been seven months since the events in the previous episode, power and food are scarce, bands of raiders and marauders roam the land. Amanda is mayor again. Rafe, Datak and Stahma were close on the tail of Pilar. Nolan and Irisa woke up outside in the snow and everything looked like it was going to be status quo... again. Then General Rahm Tak (Lee Tergesen) showed up, bent on a killing spree that included the death of all humans in Defiance. And there were the two purple "vampires," or Omecs, T'evgin (Conrad Coates) and his daughter Kindzi (Nichole Galicia), who had rescued and dumped Nolan and Irisa in the snow. They seem to be on a mission that have to focus on, rather than feed on humans. But what we got was General Tak going on a casually relaxed killing spree, shooting Quentin, Rafe and forcing Stahma to kill her daugther-in-law. So in a mere "few" minutes, the entire McCawley family was removed from existence. That's how General Tak rolls. And suddenly the creative forces behind Defiance have gone down the Game of Thrones route, killing off characters we never saw dying. In the end, Tak captures Alak, forcing Datak and Stahma to be his spies within Defiance. Oh, and those two purple "vampires," seem to have a ship in orbit full of thousands of their own kind. Which is troublesome, considering a room full of people could not take these two down. But that's all we know of these two for now. Irisa is not happy about all the murdering she has done when possessed and is having a hard time pulling the trigger. It doesn't help that the town of Defiance is out to get her too. OR, wants her to autograph some story book that was written about her deeds when she was possessed. To be honest, I like how the creative forces took this franchise and started darkening it up, making the show a slightly different version than previous seasons. We have questionable fates, but I'm sure that they've probably shaken enough spare fruit out of the tree of characters and we probably won't see any more long-term characters die. But I'd love to be shocked/surprised if we did. Kudos to the third season premiere of Defiance on Syfy.